This necklace measures 36" in length and is perfect for clipping on an ID badge. The split ring attachment is also well suited for holding a medical alert Lifeline button. It makes a great teacher gift as well. 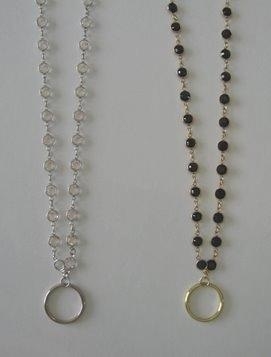 It features genuine Swarovski crystals and is available in black or crystal, and set in either gold or silver. Please specify color when ordering.